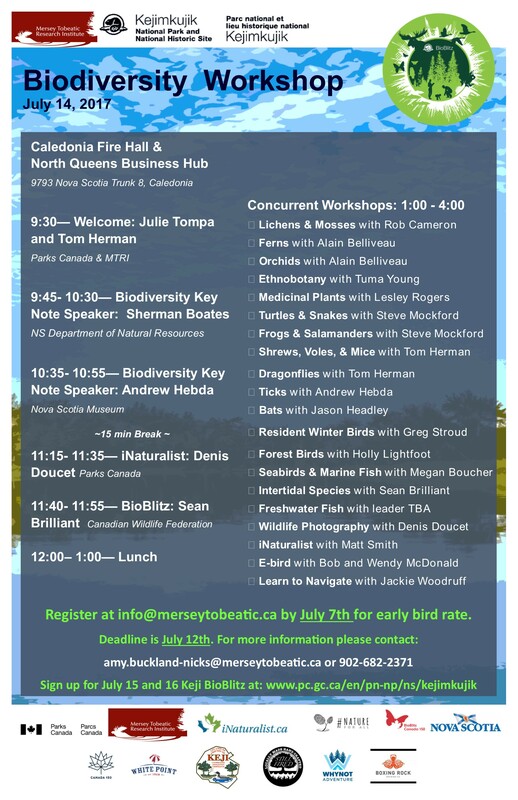 Events over 3 days hosted by MTRI and Kejimkujik National Park in SW Nova Scotia provide a great opportunity for people to learn more about and share their knowledge about the plants and animals around us. MTRI, the Mersey Tobeatic Research Institute, is based in Kempt, Queen’s County and is focused on biodiversity conservation and sustainable use of natural resources in the Southwest Nova Biosphere Reserve. The Biodiversity Workshop is their 6th annual science conference. It is being held July 14th at the North Queens Fire Hall in Caledonia, NS from 9:30am to 4pm. The workshop will cover 20 topics such as Ethnobotany with Tuma Young, Shrews, Voles, & Mice with Tom Herman, Forest Birds with Holly Lightfoot, Lichens and Mosses with Rob Cameron. View MTRI website for details, also on the poster at right (click on it to view a larger image). This summer, we’re hosting our first-ever annual BioBlitz at Kejimkujik and you’re invited! Young or old, seasoned naturalist or newbie – everyone is welcome to join in this exciting event. This entry was posted in Biophilia, Natural History, Parks & Protected Areas, Wildlife. Bookmark the permalink.